Travel. Just the mention of the word gets those bitten by the travel bug salivating. However, just travel after a while isn't enough, serious travellers want more. They want excitement, thrills, spills, the unexplained, the bizarre, those pictures that make their friends say "What the heck?" I have set off to find you some remarkable experiences around Australia and if you haven't yet experienced these 3, what are you waiting for? And hey - come back and tell us about your experiences, maybe even share a photo or two. This amazing sight takes place on Christmas Island. Most of the year around, you will scarcely see a mention of the red land crabs, as they live in secluded places deep in the hidden forests that cover a large area of the island. However, almost without warning, the wet season arrives, generally around October to November. 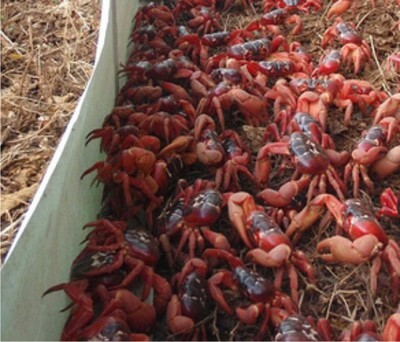 Suddenly, over 100 million huge red crabs erupt from the forest. Like a scene from a movie, they begin their descent, they climb down sheer cliff faces, race across roads so thickly cars are unable to cross. It is as if you have landed in an Indiana Jones movie. Why? At the exact moment of the turn of the high tide during the moon's last quarter, the female crabs must release their eggs into the Indian Ocean. After the eggs hatch the baby crabs and the mothers begin their trek back into the forest. The entire journey takes around 3 to 4 weeks. No one will get in the way of this maternal instinct, it is a photographers treasure trove, just don't get in their way. Flights are available to Christmas Island from Perth on Virgin airlines or Kuala Lumpur with Malaysia Air. For centuries, people have been fascinated by the solar eclipses. As a child, I recall going to school and the entire community had turned up just to watch a solar eclipse. Mythology mentions them throughout history and some can be truly inspiring. Generally, they will only occur a couple of times a year, however the entire block out is only visible in small sections of the earth. In 2012 a total solar eclipse will occur on 13th and 14th of November 2012. One of the best places to view it will be Cairns, far north Queensland. It has become such a popular pastime to watch solar eclipses, that festivals have sprung up around them, Click here for events scheduled in and around Cairns. You may have heard the saying "what's the story, morning glory". If you have been to Bali, you may have eaten fried morning glory and some people use it to describe a bodily function in the morning. However, this amazing phenomenon I am talking about is a little different. I am referring to a very rare meteorological phenomenon. It takes place in Northern Australia's Gulf of Carpentaria. It is actually a roll cloud - up to 620 miles (1000 kilometres) long, 0.5 to 1.2 miles (1 to 2 kilometres) high, and can move at speeds up to 37 mph (60 km/h). They roll around looking like puffy tubes in the sky and the best time to view them is at dawn as they roll in. As they do so, it causes great updrafts of air, making it fantastic for hang-gliding. Gliders have been known to have been carried by the morning glories for more than 700km and up to six hours. The morning glories generally happen from September to late October each year. A great place for viewing them is Burketown.